Its simplicity. Contemporary furniture is usually simple in shape and detail. Finishes, palettes, and materials might vary. But overall silhouettes are usually more significant than individual detail, which is kept at a minimum. That's why contemporary pieces don't fight with one another. The more the pieces are the same vintage — in shape, line, material and the like — the more serene the decor. Easy to mix. Contemporary pieces are usually easy mixers. A black leather and steel lounge chair works with a 19th-century veneered Biedermeier cabinet because the former is so sleek in line and understated in form. Contemporary interiors have a mantra : clean lines, sculptural furnishings, art, neutral elements and bold color. While some people dislike contemporary style for looking stark and cold, others find it exciting, urban, and fresh. It's a look that often appeals to artists and architects who love the underlying simplicity of line, shape, and form. Notice how few accessories are needed in the room pictured here. Both the accessories and art are large scale, architectural, and add texture to this unmistakably contemporary interior. The color palette in a contemporary interior can be anything from a mix of neutrals, to black and white, to the use of bright and bold color. Black is often used to ground and define a contemporary room. Line may be the single most important element of a contemporary interior. Look for it in architectural shapes and curves, in the bold use of black or color, in background details such as soaring ceilings or tall windows, and in sculptural or geometric elements and art. If you love the look of contemporary, here are some ideas for creating your own modern room. Think of museum interiors when planning a contemporary room: each element has its own space, and is set off to stand alone while contributing to the whole. Architectural and functional elements of a space are fully embraced in a contemporary interior, whether they are beautiful or simply structural. Ceiling pipes in loft spaces, broken brick walls in a former factory building, metal ductwork, etc. is often left exposed, adding textural interest and line. Learn to see the negative space (the areas around a particular object) and protect it. Make bold statements with both furniture and accessories. 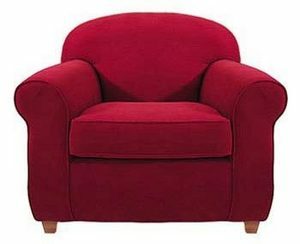 If you love red, put it up on an accent wall or choose a bright red sofa or chair. In both furnishings and accessories, skip the small, pastel, and cute. Avoid ruffles, florals, carved details, traditional shapes. Instead, go for the bold, artistic, and sculptural. Furniture generally exhibits clean, smooth lines. Cover it in a neutral, black, or bold fabric. Fabrics often have a natural look (wool, cotton, linen, silk, jute) and add textural appeal. Keep furniture details uncluttered. Skirts are often either flat or box pleated, and have no additional trimmings such as fringes or tassles. Legs are exposed and in chunky, solid shapes. Pillows add shots of color and texture in clean geometric shapes. Flooring is generally smooth and sleek in vinyl, wood, or low-pile commerical carpeting. Area rugs can add more color, texture, interest, and space definition. Animal prints are at home in many contemporary rooms. Try leopard pillows on a black sofa or a zebra area rug. Lighting is exceptionally important in a contemporary interior. Look for unusual fixtures with sculptural interest, clean lines, and perhaps accents of bold color or metallic. Install recessed lighting or track fixtures to wash walls with light. With new construction or remodels look into installing indirect or cove lighting. Highlight art by placing sculptures on columns or pedestals. Install specialized lighting for original art, framed prints, or posters. Use repetition of line, color, and form. In straight contemporary interiors it is most effective to have a few large accessories well placed. Give each piece breathing room by establishing a zone of empty space around it. Frame posters and prints simply in classic black wood, colored metals, or light natural woods. Hang groupings of pictures close together so they look like one large piece of art. Glass, metals, stone, and wood will all fit well into a contemporary interior. However, avoid a cold looking room by adding shots of warm colors and providing textural interest in fabrics, upholstery, rug, or accessories. Think of each piece as sculpture. Don't crowd it. Flower arrangements should be dramatic, large, and follow simple lines and shapes. Place them in contemporary containers that add to the sculptural look. Plants will add a shot of life to a contemporary room. Make them big, place them in simple pots, and choose varieties that have interesting leaves. Uplight them from the back and underneath. Cover the dirt with smooth rocks or chunky bark chips. Dinnerware is available in a variety of contemporary shapes, colors, and styles. Keep it simple and add interest by combining a range colors. Introduce texture with fabrics and placemats, metal, twigs, and other "architectural" looking materials.